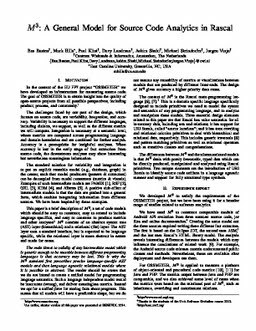 Basten, H.J.S, Hills, M.A, Klint, P, Landman, D, Shahi, A, Steindorfer, M.J, & Vinju, J.J. (2015). M3: A General Model for Source Code Analytics in Rascal. In Proceedings of International Workshop on Software Analytics 2015 (SWAN 2015). IEEE.